AutoWeek has been reminding me for the last several months that my magazine subscription is about to expire. I’ve been a long-time customer of theirs and fully planned on renewing my subscription. After three or four mailings requesting my renewal and two issues exclaiming “this is your last issue” via a cover wrap I decided to do something. It’s my form of shopping, checking things out before I lay down the cash. So, after 5 minutes of Google searches, what did I pay for a year’s subscription? $9.32! Woo Hoo! If you like to hunt down deals like I do, a Google search is all it takes to save you some dough. By the way, I found this deal at www.magazinemaster.com. 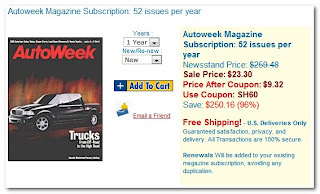 For whatever reason, if you go directly to their website and search for AutoWeek, you don’t get the special pricing. But when you search via Google you get a special link that includes the coupon code. Enjoy your hunt! And here I had just decided not to renew any subscriptions for the grandkids because the prices seem exorbitant; I’m now rethinking that.